VET-Business cooperation in the initial qualification of young people! aining event, hosted by Pixel in Florence – Italy. It was three intense and fruitful days of practical training that combined presentations with workshops, simulations and brainstorming, involving trainers and counsellors from different organisations, discussing and debating about on: •	How to integrate soft skills in the VET offer? •	How to support VET professionals to assess and promote the soft skills of trainees, actively involving them in this process? •	What do VET professionals need to know, learn and have to successfully support and guide young trainees in the definition of their programme for the development of their soft skills? •	How to contribute the establishment, strengthen and maintenance of VET-Business cooperation in VET system? Many ideas, conclusions and tips resulted from these three days of training, that will be introduced in a set of six events to be promoted in April/2019 in Portugal, Spain, Italy and Austria. Are you interested to know more about the results of the training and attend the events? Please send an e-mail to the contact of your country that you can find here. Take part of this project and build the innovative future of vocational education and training! To know more about the project we invite you to explore its website, Facebook page or contact the coordinator of the project. r soft skills, which are essential for their personal development, social participation and workplace success. VET_GPS is a European funded project managed by a consortium of 9 partners coming from different EU countries: Portugal, Spain, Italy, Austria, and Belgium. The first year of the partnership has focused on developing the “Guide for the integration of the Soft Skills in VET offer” to be available to VET providers and professionals, supporting them in the integration of strategies and practices in their VET centers, fostering the development of trainees’ soft skills. Based on the results of the guide, partners started to work on two other products: 1. Toolkit for Professional Guidance and Coaching, that includes a soft skills self-assessment tool, a soft skills development programme, and counselling guidelines to support counsellors in the guidance and coaching trainees; 2. 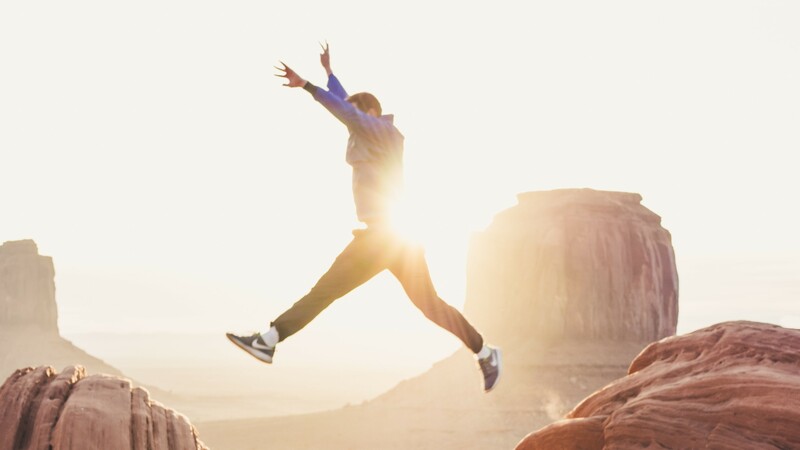 Programme for Professional Development of Trainers/Tutors, consisting in a training programme, with theory, exercises, and activities to be available to VET professionals (trainers, counsellors and/or tutors) and used in their daily classes. These products will be tested in VET centres in Portugal, Spain, Italy and Austria during 2019. In case you are interested in taking part of this pilot, please visit the project’s website (vetgps.eu) and search for the National contact of your country. Originally published at EfVET.org website. 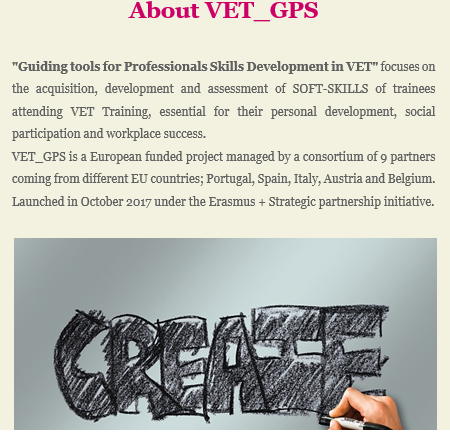 #2 Newsletter of VET_GPS project already available! (2 sessions), Spain (2 sessions), Italy (1 session) and Austria (1 session), involving 51 representatives from VET centers/professionals, representatives of companies and consultants. 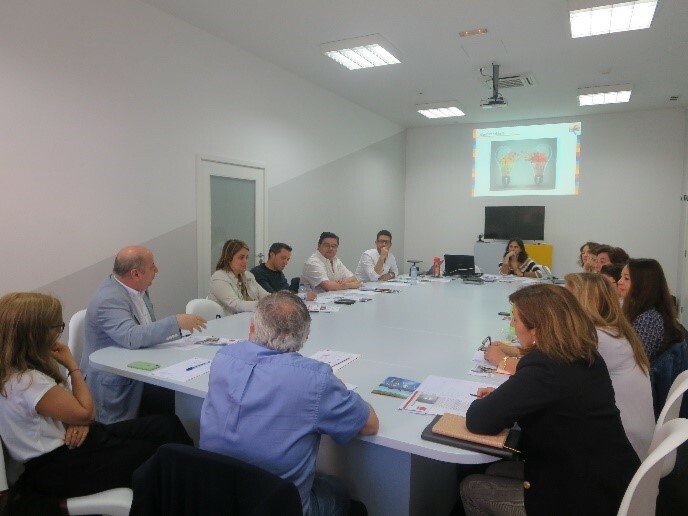 The conclusions of these focus group allowed partners to select the six soft skills, identified as being strategic by companies and VET providers and that will be approached during the VET_GPS project. In the same issue, you can find more about the presence of the project in two International events: i) The Future of Education in Florence - Italy and ii) Lifelong Learning Platform Annual Conference in Vienna - Austria. For further information about the project, please contact andreia.monteiro@mentortec.eu. lls and competencies in Europe are only recognized within the context of formal education, and thus there still persists the need to make all learning visible and to validate skills acquired from other learning environments. However, the soft skills are often referred to be as non-measurable skills by conventional tests or exams. That’s why EfVET is committed to promote and bring soft-skills into curricula of VET schools. One good example of this is VET_GPS – Vocational Education and Training, Guiding tools for Professional Skills. Therefore, Lifelong Long Learning Annual Conference was the perfect forum to introduce this forum as their theme and the project main subject are matching. The space selected to introduce VET_GPS was the Gallery Walk. 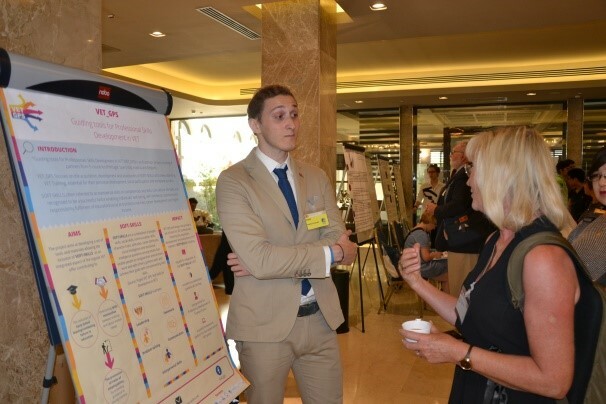 Every year, Lifelong Learning Platform offers the possibility to present European projects during their annual conference, which is the perfect occasion to exchange views with other stakeholders and learn from others. EfVET, as usual participant and member of LLLP, organized a successful presentation about VET_GPS project. 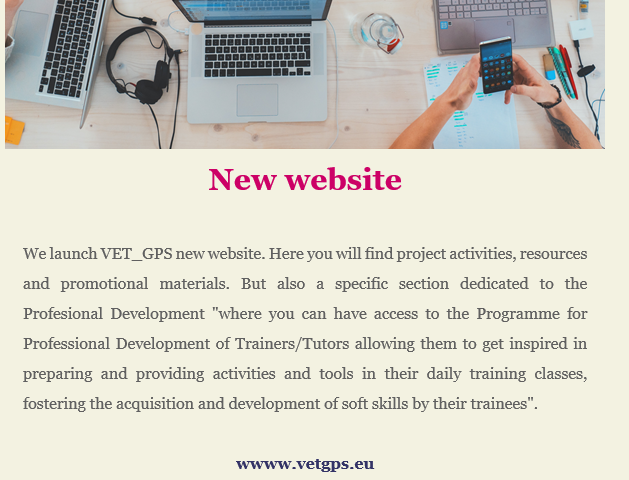 VET_GPS is willing to develop and present a wide set of tools, guides and materials addressed to trainees, VET principals/managers, VET trainers/teachers. EfVET introduced to LLLP delegates the work done so far by VET_GPS partners. So far, partners are kept working on the development of the toolkit for Professional Guidance’s and Coaching which is basically a document with guidelines and orientations to support curricula. Furthermore, the VET_GPS partner is expected to contribute to: - Increase the quality of VET provision and offer; - Reduce the mismatch between skills acquired in VET training and labor market needs. The LLLP participants were impressed by the preliminary guide for integration of the Soft Skills in VET curricula results which highlight that soft-skills are indeed supporting VET providers and policy makers to integrated a new strategies and methodologies for the future integration of these skills in VET system. The participants has been invited to visit website https://www.vetgps.eu/ and follow the project on Facebook page. Originally published at EfVET.org website. Soft skills for professional success: VET centers in the track of trainees’ success! kills. After a fruitful discussion about the data collected during the initial study held by the consortium, involving VET providers, VET trainers and counselors, representatives and tutors from Small and Medium Enterprises (SMEs), partners had the opportunity to outline the two of the most relevant outputs of the project, namely the: i) Toolkit for Professional Guidance and Coaching, that includes a soft skills self-assessment tool, an of skills development programme, and counseling guidelines to support counselors in the guidance and coaching trainees; ii) Programme for Professional Development of Trainers/Tutors, consisting in a training programme, with theory, exercises, and activities to be available to VET professionals (trainers, counselors and/or tutors) and used in their daily classes. Both outputs, jointly with the Professional Development Platform will be tested in VET schools with the support from trainers and counselors in Portugal, Spain, Italy, and Austria, during 2019. Are you interested to take part on the pilot? Please contact andreia.monteiro@mentortec.eu. arding the general theme of education. 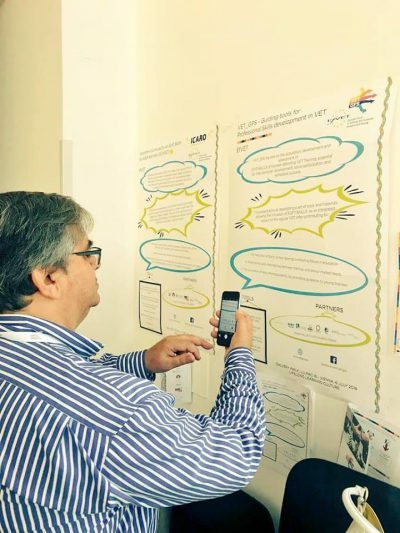 During the two days a poster session was organized where several posters concerning different researches and projects were shown, and among these Pixel had the opportunity to present the VET_GPS project. Many participants were interested and asked questions about the projects’ aims and results achieved so far, opening discussions on the topic. Different VET_GPS project leaflets were handed to the participants who show interest in the project in order to help them to be kept informed on the future steps of the project. nted with 14 experienced and expertise participants from VET providers and companies, who gave valuable inputs related to the reasons of early dropout and to the identification of the problems and possible solutions for the integration of trainees in the labour market. Soon, the conclusions from this activity will be posted, so we invite you to be tuned. For more information please contact Andreia Monteiro: andreia.monteiro@mentortec.eu. pment of the soft skills of young people attending VET courses, fostering the reducing their early drop out from VET system and increasing their competencies to successfully integrate the labor market. You can also know more about the kick-off meeting that took place in Matosinhos in November 2017 and about the introduction of the project in an information, advice, and orientation for education and works fair in Austria. Curious about the project? Contact us at andreia.monteiro@mentortec.eu. Do you know VET_GPS website!? ’ soft skills in VET centers. In this site is possible to find, not only information about the project (e.g. objectives, target groups, partners, activities and results), but also to relevant resources for the integration of strategies and the implementation of practices in VET centers fostering the acquisition of soft skills identified as being critical, by VET trainees. Additionally, VET trainers and counsellors will also have access to the Professional Development Platform, allowing them to acquire the necessary knowledge and skills related to the topic and, by this, contribute to their continuous professional development. For further information about the project, please contact andreia.monteiro@mentortec.eu. Qualified Young People on Companies! 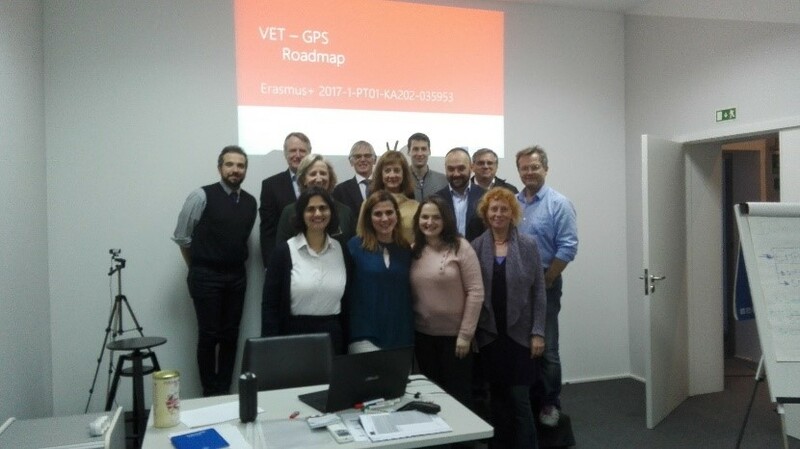 the integration of the soft skills in regular VET offer and, by this way, prevent the early VET leaving and increase the possibility of employment of trainees The Consortium, composed by 8 entities from 5 different countries, Portugal, Spain, Austria, Belgium and Italy, promote the project kick-off meeting at the end of November 2017, 28th and 29th, at Matosinhos, Portugal, hosted by Mentortec. 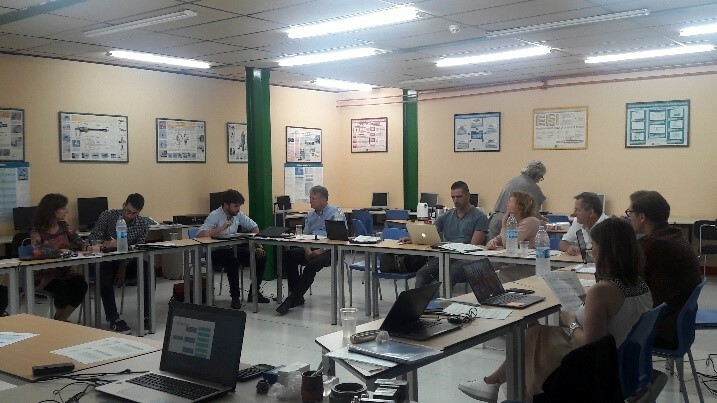 During the meeting, the main goals of the project were discussed by aligning the partners’ perspectives, as well as reviewed the first project output: a guide for the Integration of Soft Skills in VET Offer The next transnational meeting will be organized in Spain between June and July, hosted by PIT. For more information about VET_GPS, please contact Andreia Monteiro: andreia.monteiro@mentortec.eu.